This quite stupendous piece plays uninterrupted for 80 minutes, the longest unbroken span of piano music ever written. A culmination in the architectonic line of Bach, Busoni, and Sorabji, a close friend of the composer's and whose work he has edited. It should be distributed as quickly as possible, hot on the BBC's broadcast of a later live performance this year. Mark Gasser himself should be contacted. The 7th December 1998 performance marked the composer's 70th birthday, which occurred emblematically nine months earlier, on 6th March. It brought to light Mark Gasser as the work's performing successor to the composer himself and John Ogdon. I've not, alas, heard Ogdon's performance, but Gasser takes over three minutes less than the composer did in 1987 (Altarus gave no recording dates). That's one sign that he's wholly absorbed it - you couldn't rush this work. He took about the same time when he performed the work at the Wigmore Hall, on 16th February 2001. Happily this was later broadcast on Stevenson's birthday, enabling this listener to compare his experience of it in the hall against yet another off-air recording! 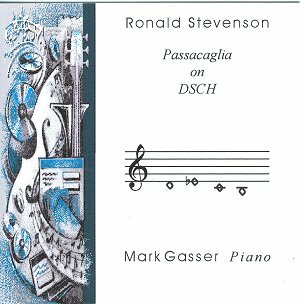 Stevenson wrote the Passacaglia on DSCH between 1960 and 1962, presenting the whole 191 page score to Shostakovich at the Edinburgh Festival in August of the latter year. In the photo, Shostakovich stands rather watchfully between the composer, still holding the score, and the poet Hugh MacDiarmid. Stevenson states in an open letter to Shostakovich (reprinted in the Altarus edition) that it took a year and a quarter to compose, and an hour and a quarter to perform. He asserts that since 1914 'melody's rainbow has been in fragments. I want you to know that some young western composers look to you with gratitude and hope because you have preserved the lineage of the great masters.' Tasking himself with such lineage, Stevenson sets about him with a Marxian will, incorporating world music and melody as he was later to do in his Piano Concerto No. 2 of 1972, 'The Four Continents'. with a difference. This is inflected with the nationalisms of the original dances. Thus the prelude is Germanic, and not quite unmeasured as these forms used to be. A Sarabande inflects French colour, an English (and Gigue-Englished) Jig, Sarabande, waltz-like Minuet, another British folk-inflected Jig, a gallumphing delicate gavotte and a truly Chopin-quoting Polonaise. You would identify the Pilbroch 'Lament for the children' even if you hadn't read the programme. A retiary delicacy informs this quiet keening, and is hauntingly beautiful. The next variation - 'arabesque variations' - affirms the 'arabesque' as rooted in such Middle Eastern music, however westernised, and stylised to stereotype, long before it became fashionable. This applies to other such music later on. The 'Reverie-fantasy' again marks a dream-like sequence of chords rising to unexpected intensity, glissandi first, a kind of wildness. It's swiftly succeeded by an extraordinary episode that requires the performer to reach over and pluck glissandi of the appropriate strings inside the piano. Stevenson did this with superhuman speed and agility, and one only wonders if he'd long hands or an incredibly adroit tape editor. Gasser managed this with great aplomb at the Wigmore, and naturally the spectacle initially detracts from the purely aural one. Finally the DSCH brings it to gently stern order. The Fanfare speeds up the motto - which re-asserts the progress of DSCH. Then comes the war sequences, with 'Forebodings Alarum;' and 'Glimpse of a War Vision'. These have an astonishing volume and array of percussive effects, knocking the piano lid, and as one commentator noted, doing a percussionist out of a job. The crescendo of DSCH against this auric nightmare is as explosive as anything in Shostakovich's 7th or 8th symphonies. The effect is hallucinatory, thrilling and even numbing. The repeated theme and speeded up DSCH over the main untransposed DSCH is overwhelmingly powerful, and might have provided the conclusion to a lesser architect. The composer noted that after playing it for 25 years he realised that this point in the work, about 35 minutes in, corresponded to a climax in the 80 minute work in the same way as 35 years did in one's life of about 80 years. This is a physical climax, as opposed to a spiritual one, which comes much later at the end. After this the Soviet Variations 'Peace, Bread & the Land, (1917)' furnish an effective, still quite strident, coda. A Symphonic March moves out of the ruins still carrying the arched spine of DSCH down the centre of the work like a porcupine. A second Episode 'volonte scherzoso' winds this to launch into another coloured area, the 'Fandango'. 'A Pedal-Point: To Emergent Africa' repeats the teasing of piano strings, and doesn't try to flicker an obvious kind of melodiousness. He never patronises with a white-tourist approach, but absorbs national idioms respectfully into his texture. Stevenson was being sensitive and tactful when few knew how to be. He was not tactful to the first, perhaps all-white, audience in Capetown, where he played this in 1963, as senior lecturer at the University of Capetown from 1963-65. One imagines Apartheid was simply so endemic that he was forced to leave. But with the plucked strings, one senses his solution, purposefully alternating with the (Soviet!) hammers. The 'Central episode: études' might look on paper as an elegant European filigree. No - they're quite explosive and constitute another thrilling point of the work, a second climax where the passacaglia is set off against climatic variations of itself. Only a second set of 'Variations in C minor' provide the necessary release that leads into the finally delicate 'Adagio: tribute to BACH'. The Shostakovich/Bach references dovetail into a texture reminiscent of some of Shostakovich's own 24 Preludes and Fugues Op 87 (1951-52), which Stevenson would have known before many others. It's a quotation from the 24th of these that appears toward the end, itself first quoting the DSCH theme as a response to the BACH after the 1950 Bach Bicentenary. Finally the 'Triple Fugue over ground - bass' opens with Subject I: 'andantamento' from the Bach tribute. This is done so quietly that we're in it before we know. Possibly it's a tribute to Bach that such joins are seamless, as it is to him that both Stevenson and Shostakovich are prepared to do homage. It builds cumulatively and then launches into Subject II: BACH which fierily vaunts the BACH theme above the DSCH ground - a fugal marriage of true minds officiated over by Stevenson. It's not at all academic, but an extraordinary play of dramatic textures that end in the DSCH thundering into the final Subject III, the 'Dies Irae' to the Six Million (recalling Benjamin Frankel's inscription to his 1951 Violin Concerto), as well as Shostakovich's own Jewish memorials. The inevitable explosion of two such powerful themes creates a grimly joyous celebration of the human spirit over adversity and terror, as well as, what Elgar would have termed, 'a massive hope for the future' after far darker knowledge. But it isn't over. There are nearly 10 minutes of a postlude set of 'Final variations on a theme derived from the ground: adagissimo barocco'. This contains the most wonderful melodic twist, quietly stated, to the entire work. In fact, this wondrous passage was directly inspired by events of April 12th, 1961. 'as though with Gagarin's perception of space', and it does convey that wondrous, disembodied effect. More, it is as near to a mystical coda as an avowed and deeply humane Marxist could allow himself. And this is a deeply humane work. The rising figure comes, too, out of the final cumulative Fugue from Shostakovich's 24th Prelude and Fugue. There is a climax - and the work refuses such triumphalism. It ends quietly restating the DSCH pianissimo, eschewing all easy victories. Stevenson's own recording, made when he was 59, benefits from a studio recorded sound just a little, and in the opening out he treads a rock-like inevitability. In the Pibroch episode and some of the other reflective passages he slows to a melancholic, wistful and genuinely involved sense of loss. Not least among these losses must have been the gradually apparent erosion of the Soviet brand of socialism he so hoped for. He may also have regretted that Shostakovich by no means endorsed such revolutionary ardour. He would have apprehended more than most, but one feels there's an extra layer of regret in his reading, as well as maturity. He yields little or nothing in virtuosity. Gasser's performance, very well-recorded in any case, brings an inexorable youthful thrust, yields little in tenderness to Stevenson in quiet passages, and adds a distinct edge of excitement. Being live helped. Astonishingly, there are virtually no slips. Editing might have played its part, but not on 16th February at the Wigmore. That performance, happily preserved by the BBC, has perhaps an even greater level of authority and excitement, though there's little to choose between the two Gassers, or all three. The Gasser is on a single CD, whilst the Stevenson is on a 2CD Altarus set, which also includes the Prelude Fugue and Fantasy on Busoni's Doktor Faust (1959), and Recitative and Air (1974) meant for Shostakovich's 70th, and ending as part of a memorial. Altarus are famously inaccessible, though some CDs reached the Wigmore for both the Stevenson and the November 1st 2000 Alan Bush concerts. They cost £29, and there are other Stevenson discs Altarus recorded with the artist and friends. The Gasser, on a single disc, comes at a far lower price, around £11. Enough said. Many would be happy to have both. Perhaps a large company could adopt the Gasser, just as Joanna MacGregor's short-lived first company, LDR's stocks were absorbed and marketed as Collins in 1990. And Mark Gasser? He's clearly on a pianistic mission. Busoni and Sorabji beckon, and perhaps some earlier Ogdon sonatas. Perhaps Sorabji's Piano Sonata No. 3 of 1922, almost as long as the Stevenson. Gasser's performance is very well-recorded, brings an inexorable youthful thrust, yields little in tenderness to Stevenson in quiet passages, and adds a distinct edge of excitement. Orders for this CD for £11 (incl postage) from 22 Deane Avenue, Ruislip, Middlesex HA4 6SR ( 0208 845 6413. It is based primarily on four notes. It is 191 pages long. The ground bass on DSCH (from the first note to the last) always appears on the same notes (un-transposed). It has a duration of around 1 hour and 20 minutes. It has 31 specific sections. It is the longest continuous piece (for any instrument) in history. "What is the piece about?" is a question all surely wish to explore on hearing such an immense work and how can we fathom the "essence" of such a monolithic composition. To answer seems almost too bold to try, but what I can express is that Passacaglia on DSCH is Epic Music to describe an Epic Century. Stevenson prophetically spoke of World Music in his Passacaglia (a phrase he surely coined - now in everyday usage) where he includes music from all 5 Continents. However the Passacaglia is not merely concerned with a facile union of the multitudinous music of the globe. I believe that it is concerned with one man repeatedly speaking to the listener with a single Beethovenian human voice : - of Dance, of Freedom, of Love, of the Super-Human inhumanity of War and the Holocaust, of Song, of Life, of Laughter, of Peace, of Fear, of Poetry, of Warning, of History, of Hope, of People and above all of humanity and hope for Humanity (i.e. the human race) as a whole. Epic art for an Epic Century indeed. The Passacaglia is now itself part of our history. The section marked "to emergent Africa" (dangerous words at the 1963 premiere at the height of Apartheid resulting in a raid on the music department at Cape Town University) are (hopefully) no longer needed in a new free South Africa. Likewise the cold war too is over and the section marked "
" (he was the first cosmonaut: circling the earth as Stevenson was writing) additionally has come full circle as Gagarin's American counterpart was at the end of the 20th Century orbiting the earth once more now well into his seventies. The inclusion of the Russian word "MIR" ("PEACE") in the score, after the ominous music in "glimpse of a war-vision", would unquestionably have seemed curious to non-Russian speakers in 1963, though now even the smallest schoolchildren know of the ageing Mir Space Station which the former superpowers are now replacing together in a new era of (comparative) intercontinental peace. most creative and artistic talents are influenced by the intellectual and artistic currents of the environment in which they live and their reaction and interaction with them. Only a genius of the highest magnitude can project his art into the future: - he does this not by some superficial technique, but by the humanity in his art - for Humanity is the only thing common to all ages." Mark adds: My private recording of the Passacaglia is the only live performance that exists - and Ronald said that it was arguably the greatest ever performance - though I doubt this very much and would encourage anyone to listen to his own studio recording on Altarus which is quite simply untouchable and pales all others into insignificance. I first decided to play the work after hearing Ronald perform it in Birmingham where he quite literally stupefied the audience. It was one of those occasions when I thought then if I could ever perform a piece like that and never play again that would be fine. To learn any of these type of work's such as Bach's Goldberg or Beethoven's Diabelli Variations or Hammerklavier you have to have a sort of insane fanaticism with the work. I learnt it as with any other piece - in sections - taking a little at a time and treating every note with the respect it deserves - concentrating on what sound, what image, what mood is he trying to evoke. Mark Gasser was the superb pianist, and without doubt the Stevenson his finest moment to date. The first item was Judith Bingham's Chopin - a homage that sounded with some of its single struck chords not so far removed from Frank Bridge's Piano Sonata of 1922-25, and something of Scriabin. Later modernism coruscates, but the impression of late Scriabin, and above all where Bridge might have gone had he not stopped composing for piano in 1928, remain. This is appropriate for, if the Bingham piece of 1979 is praised as a 'haunted elegy, summoning the ghost of the composer', these bell-like chimes summon Ernest Farrar. The effect was strangely luminous, from the slow opening, the anthem for doomed summonings perhaps as the centrepiece, and an eerie dream state of teasing dissolution. I needed to hear this short piece again as I would certainly have to the 25 Variations of Giles Easterbrook, of whose 1983 strictness he comments wryly, 'I was much younger then, and so were you.' Not that young, but these extremely compressed variations seem of their time. Easterbrook is amusing, quoting Eisler saying most Op.1s are night music or piano variations, and this set recalls Ferneyhough's Sonatas for Quartet (1967) in its blending of Webern and Purcell. Clearly Webern in the 'fanatical strictness' and (to be different) 'rigorously bitonal' organisation of all these variations that all contain the theme intact. There's a touch of later McCabe in this pianism. Orlando Gibbons is also invoked, by quotation. Easterbrook is right, it takes longer to read about than play. Seven minutes again. The interval was succeeded by the monolithic 80 minute continuous Stevenson Passacaglia on DSCH (1962), which apart from applying Shostakovich's motto-theme to hundreds of variations (evoking especially the 10th symphony, the 24th Prelude and Fugue) also daringly uses it as a melody to an almost polyphonic effect, and in its second Fugue incorporating BACH, and the Dies Irae for 'the 6 Million'. This is a deeply humane communism, incorporating (as did his later 2nd Piano Concerto of 1972) a world-music of timbres in a still moving affirmation of a better world. The first part evinces a 'physical climax' at around 35 minutes, the composer recalled later. It incorporates various European forms, the Waltz and on to the memorable Pibroch lament for children and the 'war vision' with various extra crashings from the pianist. Twice with 'Reverie-fantasy' and 'To Emergent Africa' piano strings are plucked alternating with the (Soviet!) hammers. The triple Fugue crowned all, glancing wondrously 'as though with Gagarin's perception of space'. Even here it's sometimes impossible to tell where one section begins and another ends. Gasser was phenomenal, never tiring and resounding throughout. Listening to the composer's recording which I bought afterwards, it's still difficult to separate one's experience of different sections, the whole being so ingrained with DSCH.